Every two years, artists from all around the world come to Liverpool to make and present exciting work, often taking inspiration from the city, its stories and the people that live here. For Liverpool Biennial’s extra-special 20th birthday, more than 20 galleries, buildings and outdoor spaces have been taken over with free art exhibitions and events until 28 October, ready for you and your family to discover and explore. Art writer Sara Jaspan picks her top highlights for kids and a great family day out. Step inside Tate Liverpool’s ground floor gallery and you will soon find yourself completely immersed in the magical dream-like world of artist Haegue Yang. 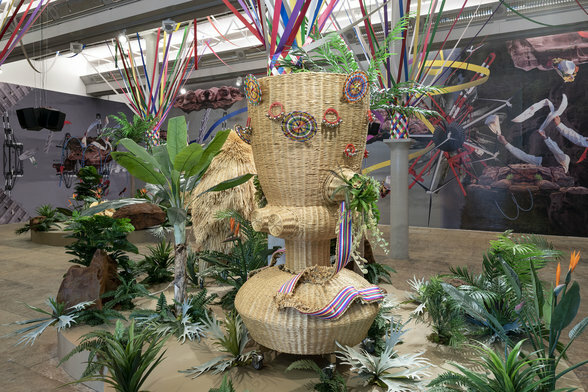 Brightly coloured ribbons, exotic plants and fantastical characters woven from straw burst from the centre of the room. A mural inspired by details from ancient and recent history covers the walls, and the sounds of birdsong, wind and water fill the air. Make your way to the top floor and you will next encounter three striking sculptures by Brian Jungen that may remind you of the headdresses worn by native Americans warriors in old Western movies. Look more closely however and you’ll find that rather than feathers, these exuberant structures are actually made from the soles of Nike trainers (in a nod by Jungen to the lingering effects of colonisation today). On the other side of the room, Dale Harding’s giant wall painting occupies the entire length of the gallery with jets of ultramarine blue and ochre-based stencil drawings inspired by the rock art traditions practised by his aboriginal ancestors over thousands of years. Speaking of drawing – make sure you save the date for The Big Draw at Tate this October half-term, with fun activities for all the family. Done with the galleries? Recharge your batteries at the very family-friendly Tate Liverpool café, transformed by British pop artist Sir Peter Blake into a dazzling sea of fun colours and shapes. Could our future cities be built from mushrooms? 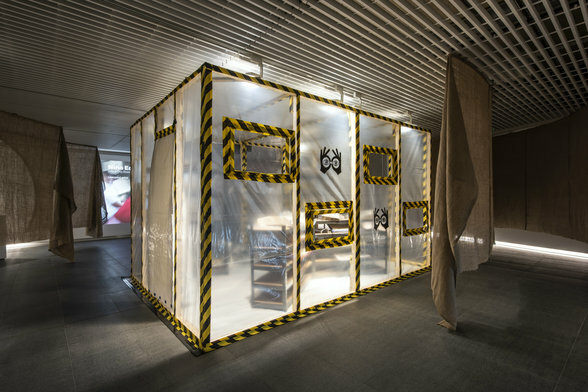 A visit to Mae-ling Lokko’s installation at RIBA North may leave you wondering. As you enter, run your hands along the living, breathing walls grown from fungi fed on agricultural waste by the artist and local schoolchildren. Take a peek through the looking holes into the central chamber to catch a glimpse of how each building block is made, and watch a short video which explains more about the process and its ecological benefits nearby. Before leaving Mann Island, also call into Open Eye Gallery where George Osodi’s colourful photographs of Nigerian monarchs capture the rich personalities and extravagant regalia of the country’s regional rulers, some of whose ancestors were kings during the times of slavery. If there’s one thing children like to do, it’s explore. 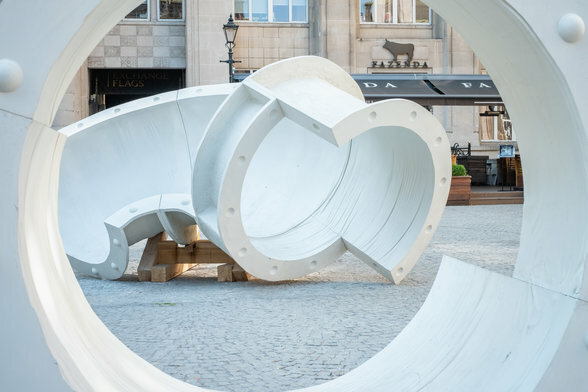 The square by Liverpool’s Town Hall, where you can find Holly Hendry’s giant outdoor sculptures, is the perfect place for children to unleash their inquisitive side (and perfect for a photo or two). Hendry’s playful structures are inspired by the mysterious Williamson Tunnels – a labyrinthine underground network built by an eccentric Victorian businessman – nicknamed ‘the Mad Mole’ – for reasons that still remain unknown to this day. Don’t forget to keep your eyes peeled for the various bits of archaeological debris embedded in the walls! Ascend the winding staircase four flights up to Victoria Gallery & Museum’s Tate Hall – bursting with all kinds of curious objects waiting to be discovered. Don’t forget to greet the sloth and aardvark on your way in! Beyond the heavy swing doors, look up and you will spot the skeleton of a bottle nose dolphin suspended above your head and a humongous hippopotamus skull just below. Braver souls might enjoy a peek inside the nightmarish bell jar collection (if they dare), containing deadly creatures like the Portuguese man o’ war; while children with a disinclination towards oral hygiene may benefit from a stop at the cabinet of historic false teeth. 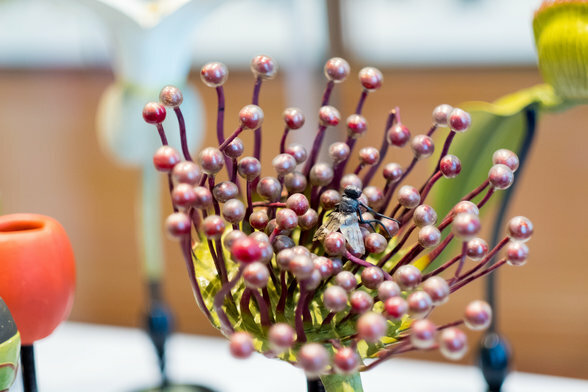 Look out for more dental specimens dotted around the room, including a giant mammoth tooth and an impressive canine embedded in another of Holly Hendry’s archaeological sculptures. Thrill seekers with an interest in preservation will also enjoy Taus Makhacheva’s video piece in which a lone tightrope walker precariously transports 61 artworks from one mountainous hilltop to another. On your way back down to the ground floor, be sure to stop at the Brendel Plant Models room on level one where the cabinets of oversized anatomical flowers have more than a touch of magic about them – reminiscent of Willy Wonka’s factory garden in Charlie and the Chocolate Factory or the Meadow of Living Flowers from Alice in Wonderland. Finally, consider grabbing a bite to eat in the magnificent mosaic setting of The Waterhouse Cafe, which has a great ‘Kid’s Box’ offer. 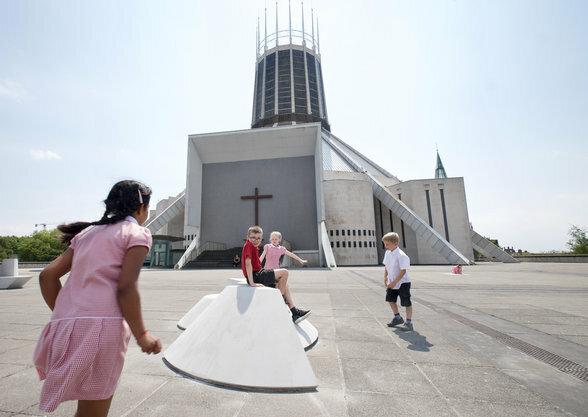 Discover the city and its remarkable architecture anew at Liverpool Metropolitan Cathedral where artist Ryan Gander has collaborated with a group of local school children to create five rather unusual benches for the Cathedral’s plateau that reinvent the building’s enigmatic design – often compared to a wigwam or spaceship. After playing on the artworks, take a seat and see if you can spot any of their shapes reflected in the impressive building or dramatic skyline around you. Leaving the benches behind, pop into the neighbouring Exhibition Research Lab at Liverpool John Moores University where budding engineers and Scalextric fans will be taken aback by artist Paul Elliman’s ‘pre-production line’ version of a Vauxhall Astra 2020, reduced to its original components of glass, rubber, plastic and rock-like lumps of metal. Second to exploring, children like mud, dirt and soil; and Bluecoat has plenty of it. 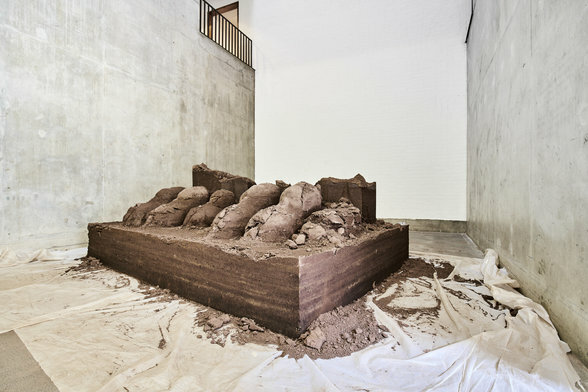 Entering the gallery, the first thing you will encounter is Abbas Akhavan’s colossal sculpture made using a technique that the artist calls ‘dirt ramming’. The clawed being that the 4-tonne remnants depict is a cross between a man and a lion based on the 5,000-year-old Assyrian deity Lamassu. Make sure you come back to visit Lamassu again to see how his appearance – and smell! – changes over the course of the festival. 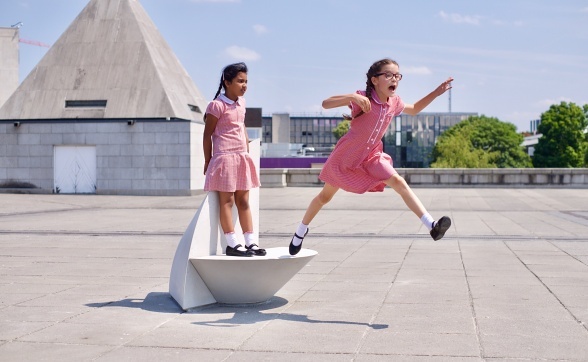 If your horde enjoyed playing on the benches outside Liverpool Metropolitan Cathedral, then they might like to meet the clever minds that helped design them. Dive into a comfy bean bag and watch a short video in which the value of children’s imagination and creativity is explored and celebrated, then check out some of the alternative bench models that were trialled in the room next door. Before you leave, stop off at the Bluecoat café and enjoy a refreshing drink or sandwich in the gallery’s peaceful courtyard garden. 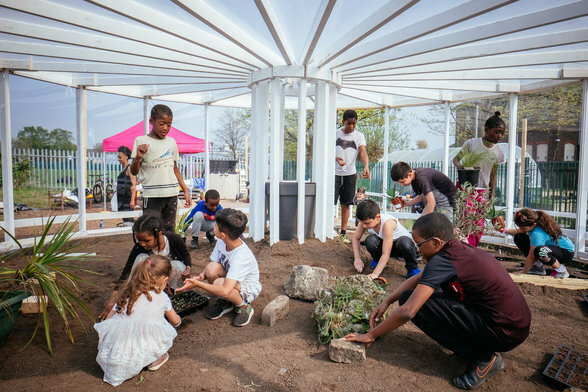 If you are visiting on a Saturday, feed your children’s nature-loving side with a visit to the Resilience Garden in L8 (open 2-5pm) where artist Mohamed Bourouissa has worked with local schoolchildren, gardeners and members of the community to create a rare oasis of peace and tranquillity within the city. Wonder down the winding paths and lose yourself in the secret hideaway places where small sculptures are waiting to be discovered. Whilst you explore, keep an eye out for the many different types of exotic plants growing, like eucalyptus and aloe vera, which are known for their healing effects and exercise your own green fingers at the free weekly Granby Gardening Club. Liverpool Biennial 2018: Beautiful world, where are you? runs until 28 October 2018.